On March 27 and 28, the University of Wisconsin–Stout gymnastics team competed at NCGA National Championships in La Crosse, WI. The Blue Devils went up against some tough competition, but managed to finish sixth in team competition. Kaylee Jondahl (So, Anoka, Minn.) said that they did not have their best performance at Nationals, but they still had many personal bests. The team was helped out by very strong performances by Jondahl and Kenzie Hyde (Fr, Sunderland, Ont.). Hyde won the bars event on the first day of Nationals. On the second day of Nationals, Jondahl scored a 9.800 on the floor exercise to earn first place. 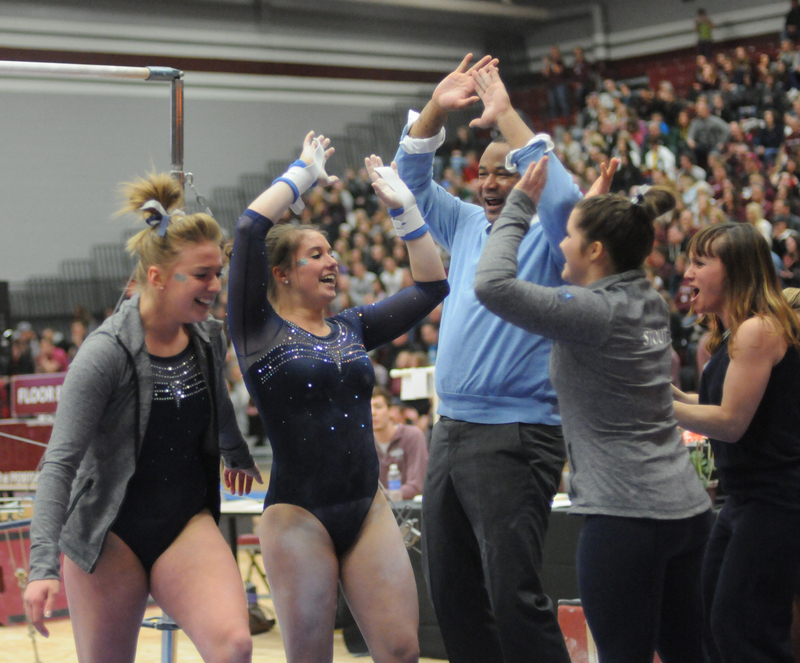 Jondahl also scored 9.675, which earned her third place on the vault exercise. Jondahl said that one of the best parts of the Nationals experience was sharing it with all her teammates. “It was fun, loud and exciting. It was something I will always remember, especially having my teammates beside me cheering me on, rather than in the stands. It made the whole experience that much more fun,” said Jondahl. Hyde stated that getting to Nationals was something that they were all excited to achieve. All their hard work paid off. “We were really happy to be there. We all worked very hard to get there,” said Hyde. Being a freshman, Hyde said that going to Nationals in her first year was something that was a really great experience. Hyde said that they didn’t set out specifically to get to a certain goal, they just focused on doing their thing and continuing to improve as the season went on. Looking back at the season they had, Jondahl stressed the amount of fun she had, and how much she appreciates that she was able to share this experience with her teammates.